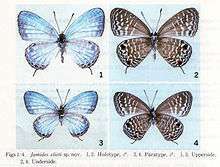 This process is crucial to the science of biological taxonomy. People's ideas of how living things should be grouped change and shift over time. How do we know that what we call "Canis lupus" is the same thing, or approximately the same thing, as what they will be calling "Canis lupus" in 200 years time? It is possible to check this because there is a particular wolf specimen preserved in Sweden and everyone who uses that name – no matter what else they may mean by it – will include that particular specimen. In zoological nomenclature, the type of a species (or subspecies) is a specimen (or series of specimens), the type of a genus (or subgenus) is a species, and the type of a suprageneric taxon (e.g., family, etc.) is a genus. Names higher than superfamily rank do not have types. A "name-bearing type" "provides the objective standard of reference whereby the application of the name of a nominal taxon can be determined." Recently, some species have been described where the type specimen was released alive back into the wild, such as the Bulo Burti boubou (a bushshrike), described as Laniarius liberatus, in which the species description included DNA sequences from blood and feather samples. Assuming there is no future question as to the status of such a species, the absence of a type specimen does not invalidate the name, but it may be necessary in the future to designate a neotype for such a taxon, should any questions arise. However, in the case of the bushshrike, ornithologists have argued that the specimen was a rare and hitherto unknown color morph of a long-known species, using only the available blood and feather samples. While there is still some debate on the need to deposit actual killed individuals as type specimens, it can be observed that given proper vouchering and storage, tissue samples can be just as valuable even in case disputes about the validity of a species arise. Each genus must have a designated type species (the term "genotype" was once used for this but has been abandoned because the word has been co-opted for use in genetics and is much better known in that context). The description of a genus is usually based primarily on its type species, modified and expanded by the features of other included species. The generic name is permanently associated with the name-bearing type of its type species. 1 2 Nicholson, Dan H. "Botanical nomenclature, types, & standard reference works". Smithsonian National Museum of Natural History, Department of Botany. Retrieved 17 November 2015. ↑ Marshall, Stephen A.; Evenhuis, Neal L. (2015). "New species without dead bodies: a case for photo-based descriptions, illustrated by a striking new species of Marleyimyia Hesse (Diptera, Bombyliidae) from South Africa". ZooKeys. 525: 117–127. doi:10.3897/zookeys.525.6143. ISSN 1313-2970. ↑ "Plant names – a basic introduction". Australian National Botanic Gardens, Centre for Australian National Biodiversity Research. Retrieved 17 November 2015. ↑ de Candolle, A.P. (1867). Lois de la nomenclature botanique adoptées par le Congrès International de Botanique tenu à Paris en août 1867 suivies d'une deuxième édition de l'introduction historique et du commentaire qui accompagnaient la rédaction préparatoire présentée à la congrès. Genève et Bale: J.-B. Baillière et fils. ↑ Weddell (1868). "Laws of Botanical Nomenclature adopted by the International Botanical Congress held at Paris in August 1867; together with an Historical Introduction and Commentary by Alphonse de Candolle, Translated from the French; Reprinted from the English translation published by L. Reeve and Co., London, 1868 (with three-page commentary by Asa Gray)". The American Journal of Science and Arts. Series II, Volume 46 (63–74, 75–77). ↑ Crépin, F. (1886). "Rosa Synstylae: études sur les roses de la section Synstyleés". Bulletin de la Société Royale de Botanique de Belgique. 25 (2: Comptes-redus des séances de la Société Royale de Botanique de Belgique): 163–217. 1 2 McNeill, J.; Barrie, F.R. ; Buck, W.R.; Demoulin, V.; Greuter, W.; Hawksworth, D.L. ; Herendeen, P.S. ; Knapp, S.; Marhold, K.; Prado, J.; Prud'homme Van Reine, W.F. ; Smith, G.F.; Wiersema, J.H. ; Turland, N.J. (2012). International Code of Nomenclature for algae, fungi, and plants (Melbourne Code) adopted by the Eighteenth International Botanical Congress Melbourne, Australia, July 2011. Regnum Vegetabile 154. A.R.G. Gantner Verlag KG. ISBN 978-3-87429-425-6. ↑ Frey, Jennifer K.; Yates, Terry L.; Duszynski, Donald W.; Gannon, William L. & Gardner, Scott L. (1992). "Designation and Curatorial Management of Type Host Specimens (Symbiotypes) for New Parasite Species". The Journal of Parasitology. 78 (5): 930–993. doi:10.2307/3283335. JSTOR 3283335. 1 2 Hawksworth, D.L. (2010). Terms Used in Bionomenclature. The naming of organisms (and plant communities). Copenhagen: Global Biodiversity Information Facility. p. 216. ISBN 87-92020-09-7. ↑ Hansen, Hans V.; Seberg, Ole (1984). "Paralectotype, a new type term in botany". Taxon. 33 (4): 707–711. doi:10.2307/1220790. JSTOR 1220790. ↑ Hume, Julian Pender (25 June 2007). "Reappraisal of the parrots (Aves: Psittacidae) from the Mascarene Islands, with comments on their ecology, morphology, and affinities" (PDF). Zootaxa (1513): 1–76. ISSN 1175-5334. Retrieved 13 January 2011.